Indian Doctors Association Calls for a Night of Celebration! Added by Indo American News on May 10, 2018. 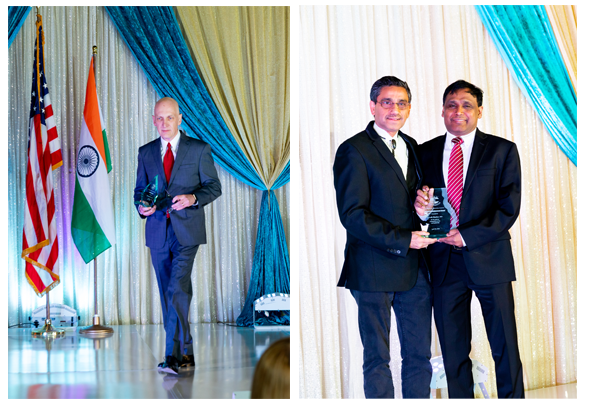 From left: Keynote Speaker, Dr. James T. McDeavitt, lifetime achievement award recipient Dr. Subodh Bhuchar, and Dr. Prasun K. Jalal, IDA President; at the Indian Doctors Association 2018 Gala on Saturday, April 28, at Hyatt Regency, Houston. HOUSTON: Houston witnessed a distinct event on Saturday, April 28, at Hyatt Regency, Houston. It was the annual gala and a Night of Celebration by the Indian Doctors Association (IDA). IDA Houston is a non-profit networking forum for physicians and dentists of the Indian origin, and it provides mentorship in academic excellence, patient care and health education for the Greater Houston community. Incorporated in 1983, IDA is recognized by the Harris County Medical Society as a member of the Council of International & Affiliated Medical Societies, and is one of the largest local chapters of the American Association of Physicians of Indian origin. The evening was truly a celebration of sorts and the gala began at 6pm with the registration counter seeing a flock of enthusiastic professionals and their wonderful families. The room was vibrant and energetic with the seasoned medical maestro’s. Cocktails were being served during networking, in the exhibit area. The ballroom was full with more than 600 attendees that included leaders of health system at the Texas Medical Center and greater Houston area. There were prominent physicians both from academic world and community, along with entrepreneurs in Houston. The National Anthem of USA and India were recited well by the playback singer Akhila Mamandur. The American stand-up comedian and entertainer, also the Emcee for the event, Anish Shah, welcomed everyone and entertained the audience with his comic acts throughout the evening. The first speaker for the evening was Dr. Prasun K. Jalal, IDA President. He is the Stan and Sue Partee Chair in Hepatology, in the Division of Abdominal Transplantation of the Michael E. DeBakey Department of Surgery and in the Department of Medicine, Section of Gastroenterology and Hepatology, at Baylor College of Medicine. Dr. Jalal is also board certified in gastroenterology, internal medicine and transplant hepatology. He shared the amazing journey of IDA; how it was established and reached its success, thanks to all of its individual supporters and supporting organizations. He informed everyone about the new website www.idahouston.org. He outlined the events organized by the association throughout the year, including the fund raising musical program on December 2, 2017, and the program on October 14, 2017 with popular ghazal singer Talat Aziz to aid in post-hurricane Harvey recovery mayoral fund. He then invited over the Current Governing Board members on stage and felicitated them. 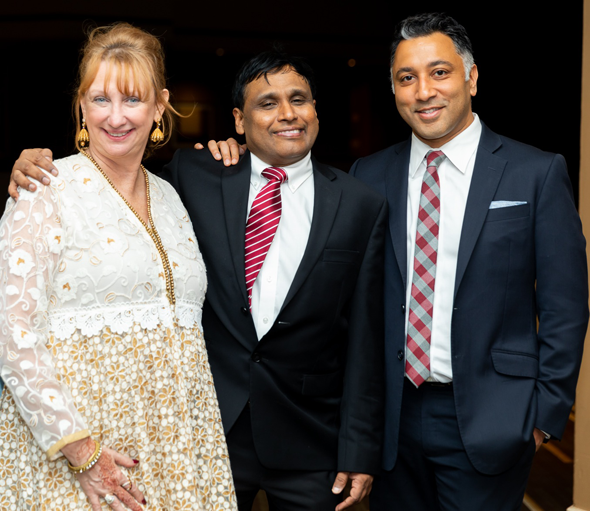 From left: Therese Cole-Hubbs, Dr. Prasun K. Jalal, and Anish Shah. IDA not only focuses on medical professionals but also mentors medical students, residents and fellows to provide an opportunity for creating a teaching and learning environment between established physicians and students, charity clinic support, community service during recovery from natural disasters in the greater Houston area, or simply by participating in local and regional health affairs. After Dr. Jalal, the platinum sponsor Harish D. Katharani- Founder & Advisor to the Southside Management Team and Amit Jain- CEO from Southside Pharmacy were felicitated. Eric Merchant from BBVA Compass, second platinum sponsor was invited on stage and he presented a check of $10,000 to IDA. Amir Dodhiya from New York Life Insurance Company, third platinum sponsor also presented a check of $10,000. The Keynote Speaker was Dr. James T. McDeavitt, Senior VP & Dean of Clinical Affairs, Baylor College of Medicine. He shared about the progress Baylor College of Medicine has made and encouraged people to become doctors, mentioning his experiences that helped generate optimism and excitement for healthcare. Dr. Jalal then presented the lifetime achievement award to Dr. Subodh Bhuchar. Dr. Bhuchar is Board certified in pediatrics and family medicine and has been practicing in Sugar Land since 1992. Dr. Bhuchar has treated newborns to seniors, and has been recognized as Best Physician Communicator and Best Bedside Manner at Memorial Hermann Sugar Land. He also serves as a Director of Physician Networks for Memorial Hermann Sugar Land and is an advisor on various hospital committees. He is a Sugar Land resident and is married to Sonal Bhuchar, and they are blessed with three children. He has a lively side to himself and that is evident as he also hosts the famous weekend talk show Open Forum. He wears multiple hats- sometimes as an Emcee and at times as an auctioneer at events. He seemed pleasantly surprised by this award and went on to mention, “Lifetime is given to people who have finished their career, heck I have not, But I am very thankful and I will accept this award on behalf of every physician in this room who wakes up early, leaves their family so that he/ she can go and fix someone else and comfort their family and everyone related to healthcare industry and on behalf of my family who hardly saw me while growing up, and I would like to dedicate this award to my wife, who has always uplifted me.” The audience was moved by his speech and cheered for him. The presentation of IDA Scholarships 2018 took place next. These scholarships are primarily based on academic performances but a fair consideration is also given to extra curricular activities, community service, research and economic needs. This respected segment of scholarships was presented by Dr. Swati Joglekar, Dr. Manish Gandhi, Dr. Jignesh Shah, and Dr. Arvind Bhimraj. The scholarship winners were Nikita Yashodhan Gidh, Arshia Batra, Monsterrat Hernandez Guajardo and Fenix C. Longoria. Following this a check of $45,000 was presented to K.C. Mehta, Director of IDC Charity Clinic by Dr. Atasu Nayak, Treasurer of IDA. The Indian Doctors Charity Clinic was established in March 1999 and has successfully completed almost 20 years of service to Houstonians of all ethnic groups. Patients can visit this clinic once a week, that is on Saturdays, from 9 A.M to 12 noon. Located at 6550 Mapleridge, Suite 229, Houston, TX 77081, the clinic is run by volunteer doctors and nurses from the Indian community in Houston. IACF directors, Mahesh Wadhwa, President and Shobana Muratee, President-Elect, along with Dr. Prasun Jalal presented a check of $15,000 to IDC Charity Clinic from the funds raised at the recently held IACF and IDA 5k Walkathon. The pledge drive at the gala helped raise over $100,000. Therese Cole-Hubbs with Electric Karma, the event co-coordinator was felicitated too. Ky Camero, the executive administrator of IDA was recognized for her hard work. Between these significant feats, the Emcee Anish entertained everyone with his jokes. 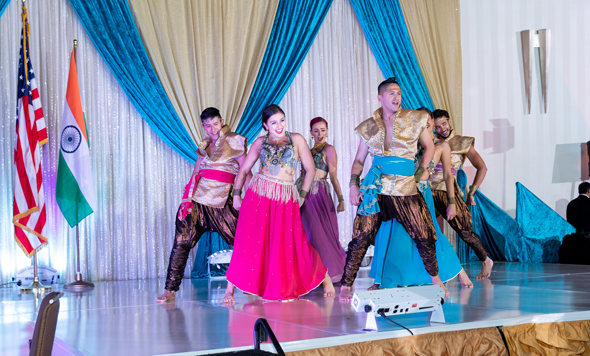 Bollywood music by Rhythm of Dreams, brought the event to life with beautifully sung Bollywood songs. Mesmerizing dance performance by Karmagraphy from Los Angeles uplifted emotions across the hall and enthralled the audience. Karmagraphy is a full service entertainment company that specializes in innovative choreography with customized performances to create an unforgettable and mesmerizing experience. Headed by Artistic Director Kavita Rao, Karmagraphy integrates culture through music, dance, art, acrobats and more. It was then time for scrumptious meals to be relished; Bombay Brasserie served delicious dinner with some finger-licking desserts. The beauty of the evening was intensified with live sounds and lights coupled with professional high-end equipment by Darshak Thacker from Krishna Sounds Production, while ROY Photography handled the visual snaps. At the end of program, Dr. Prasun Jalal thanked everyone for attending the program and making it a great success. Staying true to its theme- “A Night of Celebration” this evening seemed magical. While it provided a platform for great networking and friendship, everyone enjoyed every moment of it. The current Governing Board consists of Dr. Prasun K. Jalal, President; Dr. Swati Joglekar, Vice-president; Dr. Jignesh Shah, Secretary; Dr. Atasu Nayak, Treasurer, Executive Administrator Ky Camero.